New Orleans This is such a short limb, I don’t mind crawling out on it: every community needs a foreclosure bond. OK, I’ve said it, now what am I talking about? I interviewed Gary Davenport on Wade’s World who now works for the Mahoning County Land Bank, which is an interesting operation itself, based in Youngstown, Ohio, one of the many ground zeros in the deindustrialization in the Rust Belt. Gary and I had met briefly four years ago when I was visiting the Youngstown State University and its Center for Working Class Studies and met with community organizers there. When we were talking recently, he had told me about some interesting campaigns that the MVOC, the Mahoning Valley Organizing Collaborative, had won when he was working as a community organizer there. Foreclosure Bond Requirement. Any owner of a property which files a foreclosure action against such property, or for which a foreclosure action is pending, or a judgment of foreclosure has been issued shall, in addition to all other requirements of this Section, provide a cash bond to the Deputy Director of Public Works or his or her designee, in the sum of ten thousand dollars ($10,000.00), to secure the continued maintenance of the property throughout its vacancy and remunerate the City for any expenses incurred in inspecting, securing, repairing and/ or making such building safe by any legal means including, but not limited to, demolition. A portion of said bond to be determined by the Deputy Director of Public Works shall be retained by the City as an administrative fee to fund an account for expenses incurred in inspecting, securing, repairing and/ or marking said building and other buildings which are involved in the foreclosure process or vacant. Yes, it’s a city ordinance and that’s how city lawyers write, but you get the point. Past the problem of foreclosures themselves and the tragedy they bring to families is the attendant devastation they bring to communities, often because the bank and its servicers have limited incentives to take care of the property and the upkeep while they are trying to get it off their books. This is a problem is all communities. 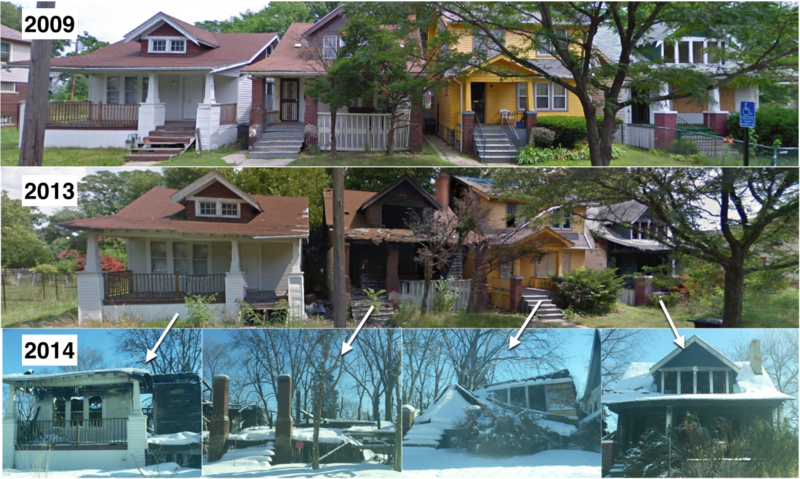 In neighborhoods where there is already depopulation due to deindustrialization, natural disaster, or changing demographics, houses can sit vacant for long periods, pulling down values throughout the neighborhood and posing safety hazards and attractive nuisances. Budget strapped cities are forced to step in to cut grass, trim trees, and sometimes to demolish the structure, and left footing the bills. The bond simply forces the mortgage holding institution driving the foreclosure to put their cash down, and do the job, so they can get their money back, and if not, the requirements of the full code give the city a way to deduct the money from the bond to cover their costs of doing the job for the bank and its servicers. Other than the fact that maybe the bond should be higher, this should be standard in every city of any shape and size! Gary said they had picked up the idea from another community organization, ADT, in Springfield, Massachusetts, and it had now been enacted in several other Ohio cities as well. Here’s a shout out to community organizers and, what the heck, to city officials: let’s get a foreclosure bond campaign in gear! This entry was posted in ACORN, Citizen Wealth, Financial Justice, Foreclosure and tagged foreclosure bond, Gary Davenport, Mahoning County Land Bank by Wade. Bookmark the permalink.